Cauterizing a skin tag is becoming an increasingly popular method for removing skin tags due to the price and the short amount of time needed to see results. It takes just a couple of second to cauterize a skin tag off and there is no need for follow up treatments. Unlike some other methods that may take a few visits to the doctor or multiple applications before your skin tag comes off. Cauterizing is using heat to burn the skin lightly with a special heated instrument usually with the purpose of sealing the skin. Cauterization is used in many medical procedures. One of them is burning off growths such as skin tags. Affordability – If you decide that cauterization is best for you, you can purchase a cautery pen for home use and remove your skin tags yourself. If you choose to pay extra to have it done at the doctor’s office, cauterization is one of the less expensive options they can offer. Possible scarring – After cauterizing your skin tag, a little scab may form at the point where the skin got burnt. Pulling this scab off before it’s ready can lead to scarring. Leave the scar be and let it fall off on its own. Possible pain – When the pen makes contact with your skin, it can start to sting. More so the larger the skin tag is. This is why we advice using a topical anesthetic cream before cauterizing to minimize any possible pain. To attempt to cauterize your skin tag at home, you need to be quite comfortable performing these medical procedures on yourself. You will be using a very hot tool to burn the base of the skin tag. The cautery pen has made home removal a much more convenient and cost-effective option. Many people choose to keep this device at home and use it to quickly remove new skin tags as they appear. It should be noted though that performing cauterization on yourself for sensitive areas such as the eyelids and groin is not advised. 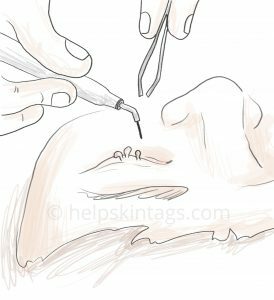 Using a cautery pen is a fast, inexpensive solution to get rid of skin tags. They can be purchased online and we advise reading some reviews to pick the right pen for you. Your cautery pen should, however, be used with caution due to the high temperatures you will be putting against your skin. Depending on where your skin tag is, you may need someone to help you with an extra pair of hands. Warning: Do not use alcohol or any alcohol solutions to sterilize the area before using a cautery pen. You will be applying high heat to the area. 1. – Apply the topical anesthetic cream to the area to you will be cauterizing. 4. – Cauterize the stalk of the skin tag. If there is any bleeding, ensure you cauterize that too. 5. – Using the (clean) cotton ball, apply antiseptic cream to the area and cover with a band-aid.